Nic Fanciulli invites an array of international DJs to join him with his all-new Social Series! Kicking off with worldwide superstar Deadmau5. Nic Fanciulli has invited some of his closest friends to join him on numerous dates throughout the Summer. 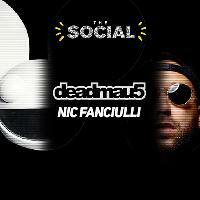 The Social is back in the UK after it’s mammoth tour of South & North America. The shows in Argentina, Mexico and Peru saw over 30,000 people descend onto some of Latin America’s most iconic venues and now they’re back with an all-new Social series! The new series will take place throughout the county town of Kent, where boss Nic Fanciulli will be joined by some of his closest friends, creating some of the most memorable parties the town has ever seen. The series is set to kick off with old friend and worldwide superstar Deadmau5, who will be making his debut in Maidstone on Sunday 5th August for an all-day launch party! Please be warned, this party will sell out in record time due to the venue’s limited capacity, so be sure to secure your tickets from Thursday 31st May at 09:00, as the first batch of tickets go on sale - set your alarms! Further announcements will be made soon. VIP Tickets Available! - Exclusive VIP arena, with lounge area, private bar, VIP toilets, faster entry + much more.